Fort Ann resident and Hope for Kenya committee member Sarah Maynard plays with sponsor student Charity Densel during a break at Joy School in Ndhiwa, Kenya. Hope for Kenya is an organization based in Hadley run completely by volunteers. Among other community initiatives it undertakes, the organization sponsors 330 kids across five schools in rural Kenya. Pastor Derek Bevan of Church of the Nations enjoys an afternoon assembly at Nytambe High School in rural Kenya. Bevan helped found Hope For Kenya, a volunteer organization based in Hadley that builds schools, drills wells and oversees child sponsorship for school fees and education in Kenya. Fort Ann resident Sarah Maynard holding hands with Hope for Kenya sponsor student Beatrice Angela Okeyo in Ndhiwa, Kenya. Sarah's son, August Maynard, follows close behind with additional Joy School students. Maynard is a volunteer committee member of Hope for Kenya, an organization that works to lift rural Kenyan communities out of extreme poverty through education, empowerment and child sponsorship. Editor’s note: Melissa Guay had the opportunity to travel to Kenya in January with members of the Hope for Kenya team to see firsthand the work the organization is doing. Her sister, Sarah Maynard, is part of the organization that is run completely by volunteers from upstate New York. NDHIWA, Kenya — Sarah Maynard of Fort Ann approached the gates of the Joy School in Ndhiwa, Kenya, in January, then peeked through the iron gates that open to the main courtyard. A smile crept across her face. “Watch this,” she said as she walked through the gate. As soon as the children saw her, they came running in swarms, yelling “Mzungu!” which in Swahili means “white person.” With deep belly laughs, running hugs and wide smiles, she was all but overrun by happy children. It was January, and Maynard was acting as part of the three-person volunteer board that runs Hope for Kenya, a nonprofit based in Hadley. Through a core team of 10 volunteers, Hope for Kenya has changed the future for many in rural Kenya. By building schools, drilling wells and helping hundreds of children climb out of poverty, they have shown that even the smallest group can make an incredible difference. 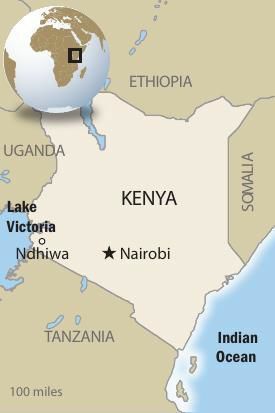 Hope for Kenya began in 2003 after a chance meeting between Bishop Peter Midodo of Ndhiwa and Pastor Derek Bevan of Church of the Nations in Hadley. “Peter asked us to help with the need they were experiencing, trying to feed and educate orphans in Kenya. I originally didn’t want to get involved, because I had my hands full here with The King’s School,” Bevan said. Bevan is also the director at The King’s School in Hadley. He agreed to take a special offering during a Sunday church service for Midodo, but nothing further. “Peter said they needed $4,000 to purchase land to build a school. We raised exactly $4,000,” Bevan said. Three years later, Midodo returned to report on the progress the donation allowed. Seeing the impact the single-classroom school had, a small group of volunteers formed Hope for Kenya and forged a partnership with Joy Schools International. They eventually raised funds to build 10 classrooms, a library, computer room, dormitories and a water tower on the property. Now more than 300 kids attend the school from preschool through eighth grade. Through sponsorship, Hope for Kenya is able to send the poorest of students to one of the best schools in the area. The Kenyan government requires school fees, and many are unable to pay. More than 200 Hope for Kenya-sponsored students are at the Joy School. The school isn’t glamorous. Students sleep two to a cot in the dorms while cows and goats, or “lawn mowers,” roam the campus. For most, all their earthly possessions are kept in a tin box the size of a small carry-on suitcase — a change of clothes, a bowl, a spoon and letters from their sponsor. Often barefoot and covered in African dust, the children flash bright white smiles that shine out in stark contrast. For more information visit Hope For Kenya on Facebook, or www.hopeforkenya.org. At school, the students get meals, education, health care, friendship and a safe place to live. They become for one other the family the AIDS epidemic has stolen from so many. They are smart — the older students speak three languages by curriculum — and keenly aware they’re being given a precious chance at a different life. “We once sat with about 30 kids from the eighth grade class and asked them what their options for the future would be without school. The boys answered sheepherder, piki driver (motorbike taxi) and day laborer. The girls answered child bride, house helper and prostitute. Both groups mentioned suicide,” Bevan said. “When asked if they knew someone who had taken each of those paths, they all raised their hands. Education literally saves lives,” he said. While the Joy School remains the hub of Hope for Kenya activity, the organization oversees the sponsorship of 330 kids across five schools, including two additional primary schools and two high schools. As Hope for Kenya students began to age into high school, their sponsorship followed them, specifically to Odera and Nytambe high schools. Seeing the nonacademic hurdles affecting student success on those campuses, Hope for Kenya again got to work. The team raised money to drill wells at both locations — in Nytambe in 2017, and Odera this past year. Beryl Ochieng, English teacher and guidance counselor at Odera, said the well’s impact went far beyond the supply of clean water. As she sat rubbing her emerging baby bump during a rest after morning class, Madam Beryl, as the students call her, spoke about the changes. “Before the well, the girls would have to leave school several times a day to collect water from nearby homes and watering holes. They would miss classes and fall behind, and often village men would take advantage of them,” she said, hushing her voice. In 2017, seven of the 30 girls boarding at Odera had to leave because of pregnancy — most of which were not consensual situations, she said. Since the well, only one has left because of pregnancy. “The girls are happier. They feel safer,” she said. Hope for Kenya built new dormitories at both high schools, the last one completed in February. Hope for Kenya team member Kevin Maynard of Kevin Maynard Construction in Fort Ann oversaw their construction. “We employ local workers in Kenya and Kevin trains them in better building practices. He donates his time and knowledge. Workers earn a wage and learn a skill, and students get a better shot a succeeding,” Bevan said. Academic success is boosted by 40 percent when a student lives on campus, because of additional instruction and an improved learning environment. “Often at home, students study by candlelight or have to do chores and watch babies. Boarding creates a real opportunity to break the poverty cycle,” he said. Hope for Kenya has now entered its next phase of intervention in the communities it serves. “We are really looking at it as a whole community model. For example, we started a micro-finance loan program for the women in the village of Dago, where we’re also building a school right now. The women have completely taken that over, and are now empowering each other to start small businesses, like selling fish at market. That’s exactly what we want to see happen,” Maynard said. Maynard owns Raina’s Jewelry in Saratoga, selling among other things handmade paper bead jewelry bought from the women in Dago. She trained the women to make the beads so they could earn a living wage. “One hundred percent of the profits from Raina’s are used toward Hope for Kenya projects,” Maynard said. “As a result, locals are now seeing us as a value instead of an intrusion,” he said. Hope for Kenya sends teams of 10-15 people to Kenya every February and October, most of them repeat visitors and sponsors from upstate New York. “The teams go and spend time with the kids and build friendships with members of the community. It reminds them they aren’t just a project to us, but family. They matter. You don’t have to be a sponsor to go, either. Anyone can come,” Bevan said. “Poverty is often a starvation of many things, including personal relationships. Our mission is to eliminate all the elements of poverty. Sometimes that means building a school, and sometimes that means showing up with squirt guns and bubble machines and playing with orphans,” he said. These organizations and people should replace our state Education Department. They sure get a lot more done with a lot less than our "caring" bureaucrats.